Smarties, We are so incredibly lucky to have the Children’s Theatre of Charlotte at our fingertips. The level of talent they bring to each performance is outstanding. Last Friday, I attended Opening Night for Last Stop on Market Street. I was familiar with the book and wondered how they would bring it to life on the stage. Let’s just say, I am still thinking about this play 6 days later. The playwright, Gloria Bond Clunie, and the vision of the creative team turned this award winning Children’s Book into real life, relatable characters. I left that night with my heart full being able to share such an amazing message with my son. Thank you for bringing this story to the stage. Last Stop on Market Street is the first production in the Children’s Theatre of Charlotte’s The Kindness Project. 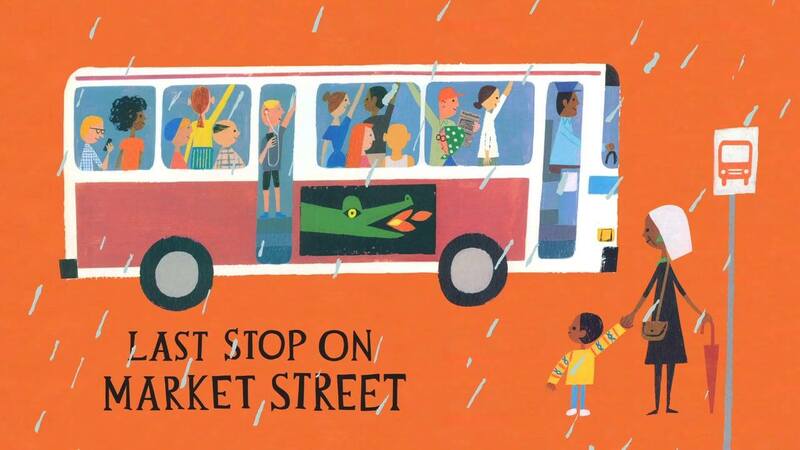 Based on Matt de la Peña book, Last Stop on Market Street is a play about a routine Sunday afternoon that turns in an imaginative, inspirational day between a grandson and his grandmother. On Sundays, CJ and his grandmother attend church. Then after, they ride the bus to the last stop on Market street to volunteer at a local soup kitchen. This Sunday, CJ was full of complaints and questions for his grandmother: I don’t want to go to church. Why does he have to go to church? His other friends don’t have to go to church on Sundays or ride the bus to the last stop of Market Street. Why don’t they own a car like everyone else? I don’t like pickles. Why doesn’t he have his own set of earphones like his friend’s in the neighborhood? Why do they have to go travel to the part of town that is dirty and scary? With every question, CJ’s grandmother replied with a heartfelt, thought provoking answer that leaves CJ unable to respond (and has the audience thinking!). You see, his Grandmother is a wise and kind woman. She inadvertently guides CJ to see the amazement and beauty in the world around him (a lesson that we all can learn from). The playwright, Gloria Bond Clunie, is the true genius behind this play. With her added touch, she brings this story to light on stage. In conjunction with the amazing cast and creative team, they creatively added a dimension that brought this story alive on stage. As we went through each scene, the characters were lifted of each page and the book came alive in my mind. The feeling was surreal. The words, the images, the message of this play really resonated with me. I left feeling reminded, inspired, and with my eyes open to the people and places around me. My eyes open to the people and places around me: We get so caught up in our own little worlds that we forget to acknowledge the people around us. **I can guarantee, not one person left the theater without thinking of how they can spread kindness in their community. With this season, Children’s Theatre of Charlotte launches a unique endeavor, The Kindness Project. They have commissioned three world-premiere plays – two this season, Last Stop on Market Street and a Sick Day for Amos McGee, and The Invisible Boy in the 2019-2020 season – that feature kindness as the central theme. They have invested in this project because, they recognize the power of simple acts of kindness hold. And we did this for one simple reason: to spread kindness wherever we can and to encourage children to act kindly toward others. Maybe you brought a neighbor’s newspaper to his or her door. Perhaps you volunteered in a classroom or paid for the coffee of the person in line behind you. Maybe you’ve seen someone else do something kind. Share your story. Friday, 11 a.m. and 3 p.m.
Saturday, 2 and 4 p.m. Sunday. * ASL-interpreted show at 3 p.m. Nov. 17. What Ever Happened to Those Welcome Wagons?